Discreet Violence: Architecture and the French War in Algeria is the title of a pop-in exhibition curated by Samia Henni and now showing at Het Nieuwe Instituut. That’s good news, but why is this exhibition about architecture as a means of control and repression hidden away? A man stands still and gazes into the camera for too long. He is about to carry some building material to help construct Camp Amal (in English: ‘Hope’) in Kabylia, Algeria, which would become his home in 1960. He is just one of the many children, women and men — over 3.5 million — that were forcibly relocated by the French army and forced to build and secure their ‘camps’ during the Algerian War of independence (1954‒1962). But the physical loads these people are carrying, and which have been extensively documented by the Service Cinématographique des Armées (SCA), seem far lighter and insignificant than the burden they seem to be carrying when we look into their eyes. The man standing still, staring at the camera, for too long, does nothing else but that, in a posture that looks almost casual, until the scene cuts. The next shot, which follows abruptly, is that of a French military officer looking casually at him. 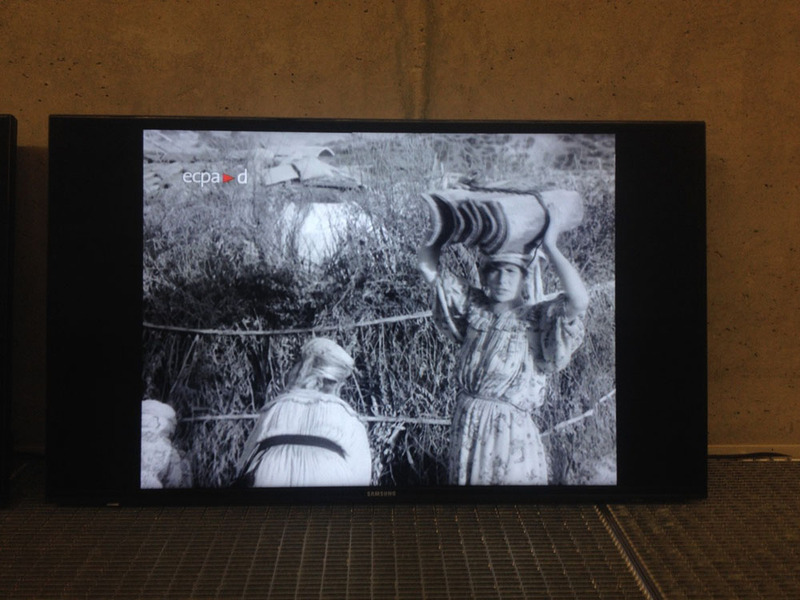 This is a scene from the last film, in a series of movies made by the SCA, on display in the exhibition Discreet Violence: Architecture and the French War in Algeria, on show until 11 February at Het Nieuwe Instituut in Rotterdam. The exhibition is presented in the corridors on the third level of the institute. How cynical that an exhibition about discreet violence, which contains sensitive and almost provocative information, based on facts and archival documents, is hidden away in such a discreet location within the museum. Little did I know, before visiting the exhibition, about the concentration camps (called ‘Regrouping Centres’ by French officials) that were built during Algeria’s war of independence. I was curious to learn about the role played by architecture and urbanism in the atrocities that took place in those places and in that period in Algeria. The presentation gives clear insight into the political master planning during the war of independence, which was aimed at securing French hegemony in Algeria during the revolution and maintaining it even after the occupation ended. The exhibition shows how these plans were implemented militarily, especially the ‘forbidden zones’ and ‘regrouping centres’. They were accompanied by violent evictions and the regrouping of civilians. Discreet Violence contains archival footage, photographs and photocopies of documents (mainly texts and some diagrams), from French sources, that explain the new zoning and master planning which led to the formation of Regrouping Centres. 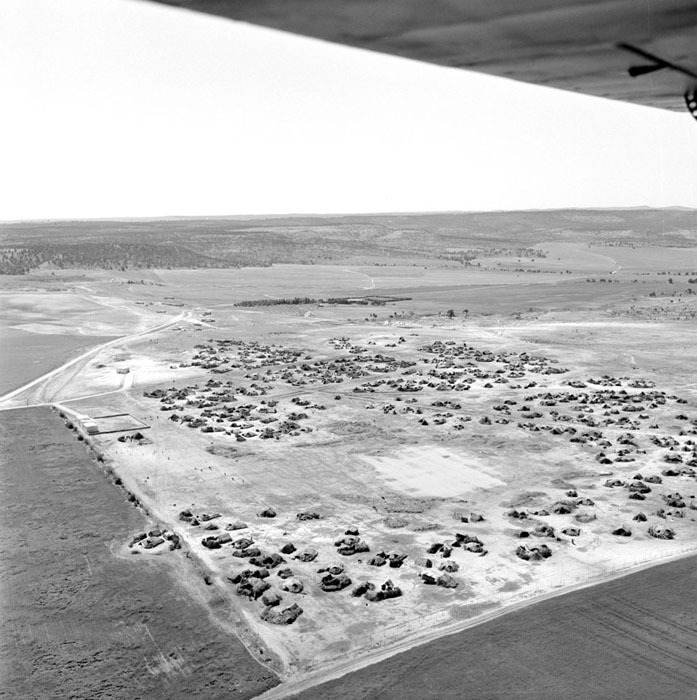 Despite the exhibition subtitle, Architecture and the French War in Algeria, there is no mention or image of the architectural design of the shelter units, nor any explanation of the urban design of the camps, the materials used, or the construction techniques applied. That is a lost opportunity, since it might have shed light on the social and political strategies of the French military forces and on living conditions in the camps. I missed such details, even though the subject concerns the built environment in relation to politics, military strategies and psychological warfare. The strength of the exhibition is that it presents information without reflection or analysis. Curator Samia Henni’s choice of videos and images is effective and cogent. The archival material itself makes a strong statement. Some printed A4 sheets that can be taken by visitors explain more about the subject. Even though the display is clear, the content accessible and almost explicitly visual, I found the exhibition too academic. Here comes a recurring question: which platform is most appropriate for exposing such narratives? And how can they provoke discussion? Subjects like that examined and presented by Henni (an academic, and this is her doctoral subject) are situated at the intersection of many disciplines, and touch on pressing issues of today and yesterday. Such subjects are difficult to communicate to a specific group or chosen audience, never mind the wider public. Presenting the bare facts of history, and questioning them, without beautifying, defending or denying, or even inciting a feeling of guilt, should be encouraged. Abla elBahrawy is an architect and researcher from Cairo. Her practice oscillates between architecture, archaeology and art. She graduated from the Jan van Eyck Academy in 2017 and the Sandberg Institute in Amsterdam (School of Missing Studies) in 2015. For sale at NAi Boekverkopers.